(Nanowerk Spotlight) Sonodynamic therapy (SDT) has attracted wide attention as a novel treatment strategy for deep-seated tumors due to its safety, tissue penetration depth and low cost. In SDT, ultrasound can cause the irreversible and fetal damage to tumor cells via heat, cavitation, or sonosensitizers. However, traditional organic sonosensitizers (such as porphyrins and their derivatives) tend to suffer from low water solubility, fast metabolism and elimination from the blood circulation, resulting in a low concentration in desired treatment locations and thereby significantly reducing SDT efficiency. Although the conjugation of nanoparticles with organic sonosensitizers improves the sensitization effect of SDT, premature leakage, instability, complicated preparation, and the high cost of these conjugations hinder their further clinical application. This situation has motivated researchers to explore the development of novel inorganic sonosensitizers with great stability and high reactive oxygen species (ROS) yield. Researchers in China now report the excellent potential of metal–organic-framework (MOF)-derived mesoporous carbon nanostructures containing porphyrin-like metal centers (PMCS) in sonodynamic therapy (SDT) augmentation. The high specific surface area and porous structure of PMCS result in excellent gas adsorption properties, providing more nucleation sites for reducing the cavitation threshold intensity. The scientists demonstrated, through theoretical calculations as well as experiments, that these MOF containing porphyrin-like structures can generate effective ROS and micro-jets to destroy cancer cells. "We have discovered a novel structure-dependent sonosensitizer that could potentially be applied for sonodynamic cancer therapy and explored its possible anti-tumor mechanism viewed from reactive oxygen species and cavitation effect," Huiyu Liu, a Professor at the College of Life Science and Technology, Beijing University of Chemical Technology, tells Nanowerk. 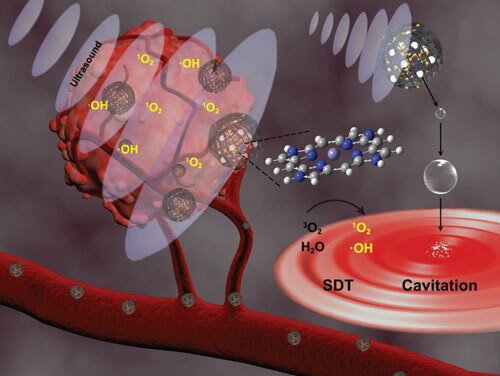 Liu and her team have published their findings in Advanced Materials ("Metal–Organic-Framework-Derived Carbon Nanostructure Augmented Sonodynamic Cancer Therapy"). They believe that this PMCS can play an important role in further exploring the SDT mechanism associated with MOF-derived carbon nanostructures and designing inorganic sonosensitizers with high ROS yield and excellent stability. "The porphyrin-like porous structure in PMCS enable it to produce reactive oxygen species efficiently to kill tumor cells," explains Xueting Pan, the paper's first author. "In order to explore the still mysterious particle-mediated cavitation in SDT, we used a high-speed camera to, for the first time, capture the cavitation bubbles growth and collapse and generation of micro-jets with PMCS under ultrasound. These phenomena can help us to better understand the mechanisms involved in SDT." Video of ultrasound-activated sonosensitizers generating ROS and cavitation effects to kill tumor cells. In the next stage of their investigations, the researchers will look for the spectral range of sonoluminescence and provide a theoretical basis for exploring and designing novel sonosensitizers. "Future directions of our work may include the development of novel sonosensitizers and exploration of SDT mechanisms," Liu concludes. "In the face of a complex tumor micro-environment, how to effectively exert the therapeutic efficacy of novel sonosensitizers and achieve clinical translation are main challenges."